Myanmar government doesn’t own the Rohingya Muslims; they don’t even recognize them as a minority. As a result, if they are killed, raped, torn into pieces or even minced, nobody cares as in the books of the government, they don’t even exist. The United Nations itself named the Rohingya Muslims, the most prosecuted minority in the world. The entire International media has been claiming the genocide against Rohingya Muslims as the “ethnic cleansing” by the Myanmar government. However, there are some people who support the killings of Muslims in Myanmar. Although there are other comments of the people in the same nature the reason people are outraged with his comment is that he is living in Jeddah, Saudi Arabia, working in Saudi Arabia, eating from the plates of Muslims and still having that much hate against Muslims? Tabrez Ahmad: I called on Jeddah office number provided on forever living products company's site. They said Rakesh Chenna is not working with them but he is probably associated with a distributor of the same company. Though we need people all over Saudi Arabia and especially Jeddah to keep eyes on him to inform the police. However, everyone keeps sharing this on social media until get affirms information of his arrest. Please don't depend on others, just do your best to catch him. Tarish Khan: I sent an email to the Forever Living and this what they replied to me. We tried to search his profile on Facebook but could not get any success. He has either removed all his photos from Facebook or deleted the profile. We could not even find any of his accounts on Twitter. 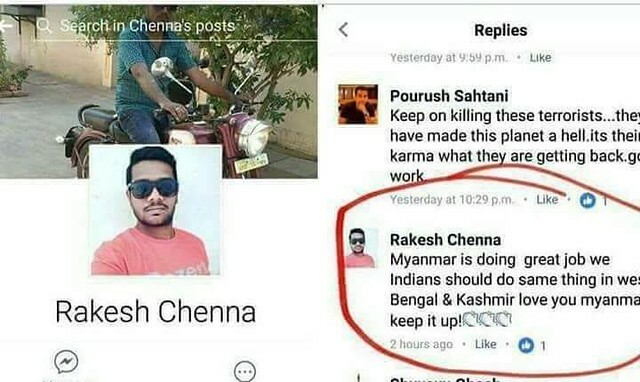 Someone has commented that “This coward named Rakesh Chenna has just changed his profile picture, cover photo, name, and address. I was keeping eyes on him, he is still in Jeddah. Can somebody trace him by the company name and inform the authorities in Saudi Arabia”. If you or anyone knows about Rakesh Chenna, you can directly go to the Police Station in Saudi Arabia and register a complaint against him under the Cyber Law. If you can’t do this, at least share it with others so that someone else can take this action.